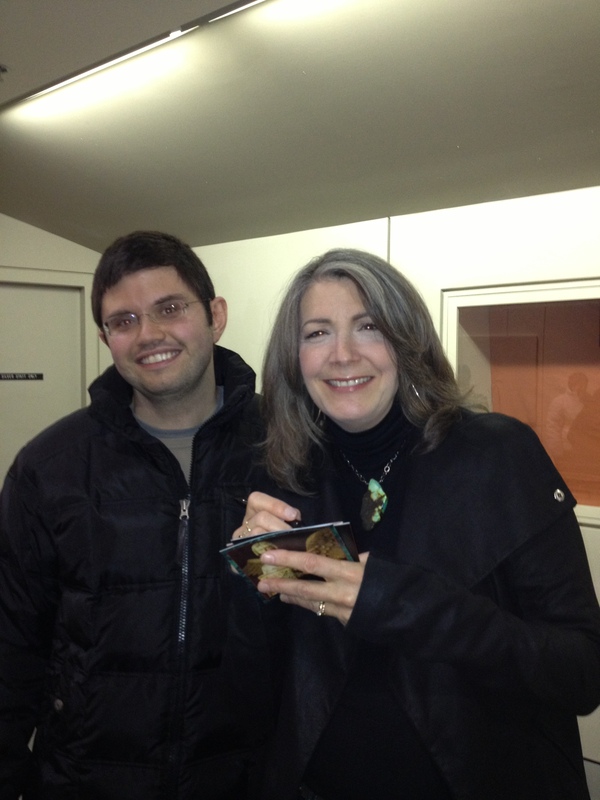 Kathy Mattea came ready to give it her all. Amidst a blinding snowstorm, and the after effects of the head cold that had eluded her to three days prior, she took the stage Feb 23 in the teeny 665 seat Hanaway Theatre (located in isolated Plymouth, NH) with just three other musicians, a caravan of guitars, and a message. Of late Mattea has been outspoken on the subject of coal, or “Black Gold” as she sings in a recent song. Her crusade opened a so-far two-album floodgate, a life-changing detour into the Appalachian Folk songs of her West Virginian heritage and the most fully realized music of her thirty-year recording career. Her otherworldly alto graces the lyrics of Jean Ritchie, Laurie Lewis, Hazel Dickens, and Alice Garrard with the plainspoken beauty of a woman directly in line with her authentic center. But even more impressive is Mattea’s ability to blend the “new” with the old, creating a woven tapestry linked by environmental cause, a deep sense of history, and a sharp ear. She opened with the first track on Calling Me Home (“A Far Cry”) before launching into “Lonesome Standard Time,” her #11 peaking single from 1992, without skipping a beat. She then graced the audience with my favorite of her singles, “Standing Knee Deep In A River (Dying of Thrust),” which was recently reinstated back into her set. The intermingling of her past hits and newer material took me by surprise. I expected Mattea to focus mainly on the subject of coal, with a dusting of her biggest hits, thus leaving non-signature tunes as distant memories. But instead Mattea covered the hallowed ground between her past and present with the seamless ease of a songstress in tune with every note, paying close attention to every lyric. Dressed in a mint green blouse, black jacket, and casual leggings, Mattea had the confidence of a seasoned professional but the cool of an everywoman; she was one among equals not a star singing to a crowd. Her greatest virtue was her subtlety, showcased through her candor and humor, on par with that of a next-door neighbor, a friend. She greeted us like we’ve known her all our lives, commending us “Plymouthians” on our toughness in weather, braving a major snowstorm like a bright sunny day. Later she encouraged communal participation, denouncing those who belittled us for an inability to carry a tune, before having us sing loud and proud on multiple choruses of both “Eighteen Wheels and a Dozen Roses” and “Come From The Heart.” The latter bonded us as a tight-knit family – she enthusiastically attempted to get us clapping on the offbeat, which wasn’t meant to be. Clapping on all beats didn’t work either so plan B had us singing “You gotta sing like you don’t need the money, love like you’ll never get hurt, dance like nobody’s watching, it’s gotta come from the heart if you want it to work” at the tops of our lungs. Further audience participation caused an off-script deviation into “Mary, Did You Know” and a proclamation that it wasn’t included with the $35 ticket price. She rolled with the flow, only grappling with the tune to see if she could reach the high note without her head popping off (she did have a head cold, after all). The song soared, and proved that sick or healthy professionalism wins out every time. My favorite moment of the night confirmed another of Mattea’s many facets -her shrewd intellect. Her successful blending of old and new cumulated in a shared linkage – most of Mattea’s songs are deeply rooted in various fossil flues, albeit generally indirectly. I’d never viewed her material from such a focal point before, and she gracefully clarified her hypothesis, explaining how she’s singing about the diesel fuel of trains (“Lonesome Standard Time”) and the long hall truckers (“Eighteen Wheels”) to the coal. This led to a fabulous rendition of “455 Rocket” (fossil fuel: gasoline), her 1997 single and final top 20 chart hit. (In another showcase of her clever humor, I loved how she modified the line, “as we skid I thought I heard angles sing (sounded like the Beach Boys)” into a sly commentary on Beyoncé’s recent lip-synching scandal). Mattea went on to grace us with more stories – how she first played the banjo in college only to pick it up again more recently, and the time she performed in newly restored theatre in Ohio, only to find out the majority of the audience didn’t know whom she was. She was candid on the subject of marriage, mentioning her and Jon’s recent (the prior week) 25-year milestone, gracing us with “Love Chooses You,” a Willow In The Wind album cut, and the song sung at their wedding. Before “Love At The Five and Dime” she remarked on Nanci Griffith’s writing, likening the second verse to poetry, and shared that her classic “Where’ve You Been” almost wasn’t written, if co-writer Don Henry hadn’t been in the room. The latter came with a tale about a man with Alzheimer’s who’d forgotten his wife, until a visit in which she and their daughter were yelling at each other – and memories came flooding back. Some of my favorite moments weren’t even the older hits (she also sang “Untold Stories,” another unexpected surprise) but the new material, even more simplistic on stage, than record. The quiet beauty of “Agate Hill” elicited tears, while her effective reading of “West Virginia Mine Disaster” showcased her storytelling prowess. “The L&N Don’t Stop Here Anymore” was a nice uptempo change of pace, and “Coal Tattoo” really let the band rip. My other great joy, and the benefits of my front row center seat, was witnessing the nuances of the band in action all evening. Sitting that close, I was able to take in all that was happening on stage and watch the four musicians bring each song to life with the fullness of a full ensemble. The front row seat brought an appreciation to the evening that even two or three rows back would’ve made near impossible. Seeing Mattea live was one of those musical highlights of life where everything comes together perfectly for a truly outstanding evening. She’s an otherworldly talent who has only aged with sincere grace and humility since her Nashville hit making days. If you’ve never attending one of her shows, or if it’s been a while since your last evening with Mattea, it’s well worth it to catch her when she’s in your area. It’ll likely be one of the best musical nights of your life. That was certainty the case for me.